Since the release of his first Western, “Massacre,” the world has been hearing a lot about Lon Safko. With that first book now available as an audiobook, and his second book on the market, I decided to sit down and find out the motivation behind the success of Lon Safko. What makes him such an interesting author to read? What gives his Westerns that ‘punch’ fans love? Why was his first book such a genre favorite? As we conducted this interview, it became clear that a writer like Lon Safko has to exist. There has to be a writer who screams quality, and tells the tales of the West we never knew. Without any further discussion, I want you to read this interview with one of the finest Western writers of our age. Lon, why did you want to move into the Western world? I’ve always been fascinated by Westerns. As a Western reader, I’ve been noticing lately that there’s low supply—and high demand—so I decided I would start to share my own stories with readers. I think the Western is one of the most important genres in the world. The Western is America, and we need to cherish it. We need to cherish our history. Everyone is all excited about the romance novels, the erotica, the vampires—but Western readers are plentiful, and they yearn for stories of the Old West. With time to spare and plenty of ideas in my head, I thought I might be able to please some of them. Do you think the Western is going through a resurgence? No. I don’t think it’s ever been out of fashion. I think the publishing houses have forgotten them—but the readers are still there. Just because Pat Boone isn’t making record sales anymore, it doesn’t mean people aren’t buying tickets for his concerts. Unfortunately, every entertainment industry is hemmed in by what is popular, or hip, or cool, or considered desirable. The consensus is that if what you have isn’t part of the “cool,” it’s not going to sell. Well, it just isn’t true. Some of the greatest artists have been pegged as not being part of the in-crowd, yet many of them are sitting in Malibu drinking their pina coladas because they have strong fanbases who don’t care if they’re number one; they just want to see, listen and read what they like. Why do you think Westerns have maintained their popularity? Simply because people respect the beginnings of our great country. People want to be part of what we have to offer, and they want to re-live some of the most exciting times ever. Can you imagine what it must have been like for the pioneers? The gunfighters? The early lawmen? Can you imagine what it was like to live in a lawless place? You can’t get into a time machine, but you can live the life through fiction. How many Western novels do you plan to release? A whole series. I can’t put a definitive number on how many books are in my series. We have just released the second book, “Love, Lust, Death,” and will be moving onto the third book this month. The first book in the series, “Massacre,” was very well received, and I believe people will tune in to see what happens next. Do you enjoy other Western novels? Certainly. I have read a great many of them. From classics by names like Zane Grey to some of the newer stuff by Cliff Roberts, G.P. Hutchinson, Frank F. Fiore… the list goes on. Do you know what makes a great Western novel? No? A great Western is one-third Bible-based, one-third action-based and one-third dialogue-based. You have to have an age old theme—and all the age old themes of note are in the Bible. You have to have the right amount of action to keep readers reading, and you have to drive the story with dialogue. I’m not sure that I’ve managed to write the great American Western—but I’m sure trying—and making sure to follow my own rules. How do you write your novels? How does anyone? I sit down in front of my computer and spill my ideas onto a Microsoft Word page. Then I arrange them in such a way that I can see a story. Then I connect my ideas together and take out the ideas that don’t fit. Then I hone, shape and fascinate myself with the story I’ve created. Sometimes, I ask myself if I wrote the story, and I’m not entirely sure I can say I did. I think my subconscious did all the work, and thank God it did because my stories seem to keep readers entertained. What was your first experience of the Western? My first experience of the Western was John Wayne. I saw his movies when I was a kid. We would pile down to the local movie house and see them one after the other. I don’t think there was ever another movie star like The Duke. Would you ever consider writing a series outside of your current series? You bet. I have one in mind at the moment that would take place shortly before the Alamo. I also have a Western detective series, and a crime series that I’d like to get out there. I just need to sit in front of the computer and let those ideas spill. Once the ideas are out, they can never go back again. They must be read. Where can we find your latest book? Head over to Amazon, punch in my name, and pick out the book called “Massacre” first. When you’ve finished reading that one, move onto “Love, Lust, Death.” Then keep your eyes peeled for the other books in my series. There will be more coming—that’s something you can be quite sure of. 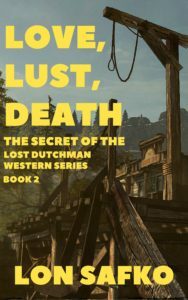 You can download your copy of “Love Lust, Death: The Secret of the Lost Dutchman Western Series: Book 2” today from Amazon Kindle. It’s just 99 cents… so enjoy your weekend with a book that will give you pleasure, for less investment. You can’t go wrong with Safko.